'Cause Why Else Would the Rat Even BE Naked? | Do Try This at Home: 'Cause Why Else Would the Rat Even BE Naked? 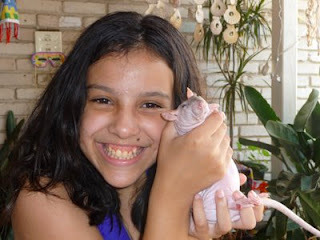 Now before I can even begin to think about the cat and the computer, lack of internet and TV etc, let's talk about the naked rat!!!!!!!!!!!!! Firstly, why is he naked? Secondly...tattoos???????? ?Is there not some animal cruelty law against this? 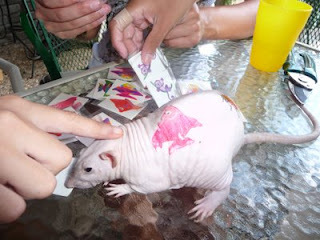 I love the temporary tattoos on the naked rat! Oh no! That poor rat. Is it OK to put tattoos on a rat? Also, your cat is so cute. 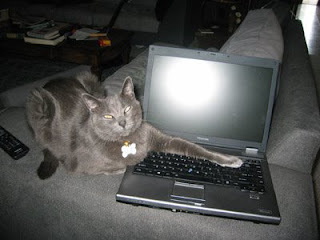 If the cat does mail the people in your list you can rest assured nothing much will be done about it! 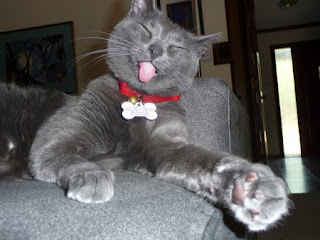 Sorry, I hate to diss other peoples' pets - to each their own and all that - but come on! Doesn't your cat have any sort of primal hunting instinct? Why hasn't he taken it out yet? So let's get back to the rat....I mean, is that really a rat? Or is it a naked mole rat? It doesn't look quite ugly enough to be a mole rat. Is it going to grow into that skin or is that it for life? Cos I would be booking into a plastic surgeon if I were that rat and getting a bit of a tail-lift. The tattoos are BRILLIANT. But did the rat choose them himself? For a rat, even a temporary tattoo is probably a pretty long-term decision. 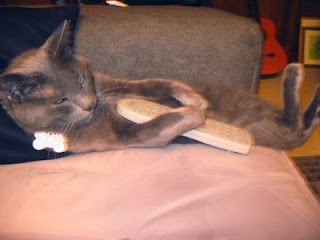 Love those pics of the cat, lol. 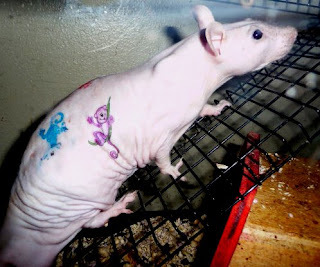 As for the naked tattooed rat.....there are just so many things wrong with that...........shudder. And thanks Alf!!!!! It must have been okay, I guess. At least Bernardo didn't appear to mind. SJ - Well, at least as I said to Arizaphale, we're not going to be strip searching the 13 year olds. Maybe once we've gotten the humans treated ok, we can rev up the treatment for the cats and hairless rats. A Free Man - If it's any consolation, Sugar did eat my class pet fish once! 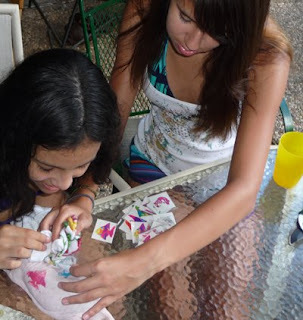 But Bernardo the rat actually belongs to my friend and her family. Oh! Arizaphale, I think he's just a naked rat & not a naked mole rat. As for his skin, he's just really, really OLD. He's old and wrinkly. There are parts of him that don't even lift up off the ground when he walks around. He needs an all-over lift I'm pretty sure. He's an OLD naked rat? I thought he was just naturally "naked" like those naked cats - wasn't there some naked cat on one of those Austin Power movies? Maybe sugar didn't take the naked rat out because he thought the rat wasn't tasty enough? Or maybe only naked cats chase naked rats? Anyway, Sugar is as adorable as ever! I thought the tattoos on the rat a hoot. I wonder how long they'll take to wear off? Ms. Q!! Where on Earth have you BEEN?!? I tried emailing you, btw, but I might not have a good email address for you. My email still works and I did get your note, if a few weeks later due to the fact that I hadn't checked it in forevah AND it was buried in spammage. I responded as well as re-responded but maybe my response got lost in your spammage! Ms. Q - Never saw your reply but hope you're doing well. I'll write again - maybe the response did go to spam or somewhere??? ?